Themed internet-ready sections, comprehensive and illustrated articles (photos, videos and graphics). AFP delivers turnkey editorial content for all digital platforms: websites, mobile sites and applications, tablets, public screens and connected TV. Mongolian sumo grand champion Hakuho has been reprimanded for leading the crowd in an impromptu round of hand-clapping after winning a tournament last month, a spokeswoman for the ancient sport said Thursday. Over 120 categories provide rich, detailed and in-depth coverage of world news. Over 1.250 complete articles are published daily, from live news coverage to sports results feeds and election results. A wide range of themes and integration to suit your needs. Receive articles in real time and by chronological order for simple and comprehensive integration of international news. Customise integration with text layers, document organisation and interaction with other documents on your site. AFP offers different headline lengths to suit your needs: SMS, scrolling ticker, public display screens, etc. – 35 characters – 51 car. Kumzar village in Oman has a thousand year-old language of its own that no one else on earth understands Home to 4,000 people and overlooking the strategic Straits of Hormuz that Iran has threatened to close, Kumzar village has a thousand year-old language of its own that no one else on earth understands. – 104 car. – 201 car. 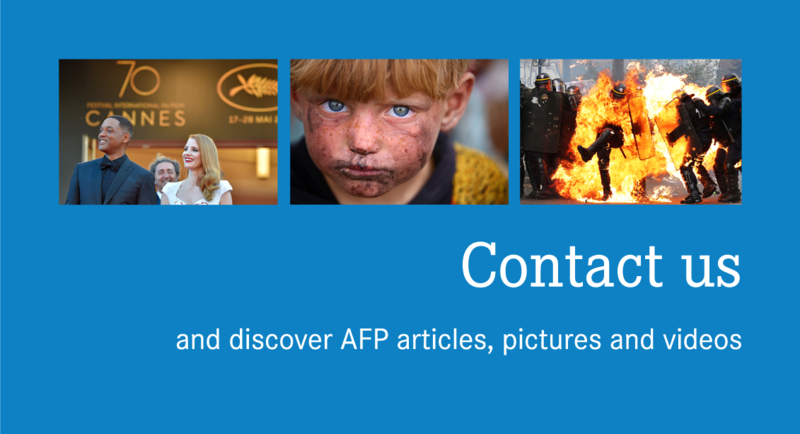 The best of AFP photo content optimised for all of your platforms. Video galleries optimised for mobile, featuring the best of AFP content. NewsML format enables you to select standard integration for all elements or customise your content integration. Newly crowned Masters champion Tiger Woods announced Thursday he will return to Japan for the first time in more than a decade to play in a new US PGA Tour event in October. Xolani Zingeni plays scales on his violin overlooking a muddy courtyard as his teenage sister washes laundry in a bathtub and his great-grandmother carefully hangs it on a washing line. Actor Ken Kercheval, who played the role of Texas oilman Cliff Barnes opposite Larry Hagman's devious J.R. Ewing on the hit TV series "Dallas," has died at age 83. Pop princess Britney Spears took to Instagram Wednesday amid swirling rumors she was being held against her will in a mental facility, telling her 22 million followers: "All is well." US actor Michael Madsen, best known for his roles in Quentin Tarantino films including "Kill Bill" and "Reservoir Dogs," has been charged with drunk driving, authorities said Wednesday. A professional gambler with nerves of steel and an encyclopedic mind has just surpassed the $1 million mark in earnings on the popular US television quiz show "Jeopardy!" -- in lightning quick fashion. As the diesel generator rumbles to life in the heart of the Amazon rainforest, teenagers scramble to charge their phones and watch music videos -- an ordinary pastime in an extraordinary setting. Griffon vulture Nelson crossed into war-torn Yemen in search of food but ended up in the hands of Yemeni fighters -- and temporarily in jail for suspected espionage.